The 33-song album, "Connect The Dots and Go For It", becomes available Tuesday, April 10th. When we connected with The Fender Music Foundation, we knew we wanted to help out their cause in any way we could. This spring, Rabbit! is partnering up with The Fender Music Foundation, re-releasing its first two records as one 33-song mega-album and giving half of the proceeds to The Fender Music Foundation. Rabbit! 's new album, entitled "Connect The Dots and Go For It", will be available at the normal price of a single album download and has a digital release date of Tuesday, April 10. "When we connected with The Fender Music Foundation, we knew we wanted to help out their cause in any way we could," says band co-founder Ashton Allen. "FMF's mission really speaks to us when it comes to music education and finding creative ways to provide additional resources for kids." Allen, along with his band cohorts Devin Moore, Emma Branch and Yara, form Rabbit!, an indie electro-acoustic bubble gum pop collective that writes and plays music with the unique ability to coalesce the family unit. Rabbit! has been lovingly labeled "kids music for adults," with catchy and vibrant songs that appeal to the youngest of listeners, yet with enough wit and sophisticated craftsmanship to give grownups something to sink their teeth into. Rabbit! has gained recent attention through several national TV commercials, as their sound has been featured in all-ages-friendly ads from brands such as Frito Lay, Mott's, Baskin-Robbins and Crayola. Last summer, they toured 45 cities in 48 days, using their travels to not only share their happy brand of indie pop but also as an opportunity to get out of the typical club circuit and experience, explore, and learn about people and programs that celebrate kids, music and a true sense of community. Rabbit! is currently in heavy rotation on Sirius XM Radio's "Kid's Place Live" station and can also be heard as the "hold" music when you call online retail giant, Zappos.com. The Fender Music Foundation believes that music participation is an essential element in the fabric of an enduring society. The organization aims to keep music education alive and available in our nation’s schools and communities. Founded in 2005, this public charity has reached over 147,000 people through its grants to music education programs. These grant recipients, which give more people the opportunity to make music, include school music classrooms, community based organizations and music therapy programs. 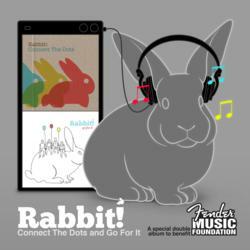 For album details and more, find Rabbit! on Facebook and follow @saverabbit on Twitter. For more information on The Fender Music Foundation, please visit fendermusicfoundation.org.